I have been an avid bird photograpaher for a long time and have always enjoyed seeing pictures of wild Tigers. Often even dreamt of shooting these majestic creatures who also happens to be the national animal of India. Well over the last weekend, this dream came true and below is a brief travelogue of the trip. It so happened that a close friend of mine could not make his trip to shoot the tigers that he had booked a while back owing to some unavoidable work appointments. He offered the trip to me and in the nick of time, I managed to book tickets from Dubai to go to Bandhavgarh Tiger Reserve BTR (Madhya Pradesh, India). The highlights of the trip were quite a few. I am one of the two people in the exclusively customised safari jeep. My partner for this trip was none other than renowned wildlife photographer Mohan Thomas (I fondly call Mohanji). The driver of the vehicle is none other than Salim Bhai along with our naturalist, Kantha Bhai. Many other wildlife photographers in India vouch for their expertise in tracking as well as driving the safari jeep to a position most conducive to shoot Tigers. Both of them are so much in demand that they are usually unavailable for a safari and this time, they agreed on Mohanji's accord. Last but not least, all four days, we were going to do a full-day safari (5am to 7pm) which is considered relatively expensive and uncommon is other national parks. 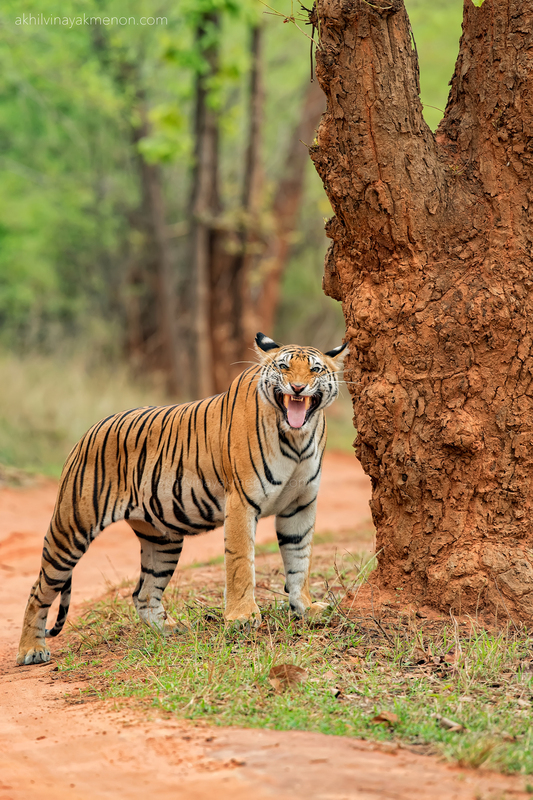 Now, last minute trips are never easy and travel connectivity to tiger reserves from cities usually involve hours of travel. I flew from Dubai to Nagpur (Maharashtra, India), waited for 6 hours in the airport to be joined by Mohanji (coming in from Bangalore) and then it was a long 8 hour drive from Maharashtra to Bandhavgarh in Madhya Pradesh. So a whole day was just spent in reaching the destination. Just to make matters worse, we learnt, on our way that as of the day before our safari started, the forest department has restricted all full day safaris to one zone only which otherwise was open to all zones. This was a major blow as this meant that we did not have the option to swap zones if we did not have enough sightings in a particular zone. There was also occasional rains which meant that the Tigers won't visit on the road or near the waterholes. Irrespective of the earlier mentioned issues, we were hopeful for good sightings as most of the Tigers in the reserve had recently had cubs. I was very keen to shoot some cubs as well if I got the chance. We were put up very near to the Tala Zone at Nature Heritage Resort, so we started just 10 minutes to five. We were welcomed by a beautifully lush green forest and I just fell in love with the place, the very first day itself. We managed to shoot a Jackal on the day, spot plenty of tiger pugmarks and even chase a lot of alert calls made by Chitals as well as Lagurs however we had no tiger sightings, the entire day. Disappointed, we retired back to base camp by 7 in the evening. Among the animals seen were Grey Langur, Spotted Deer (Chital), Sambar Deer, Rhesus Macaque, Asiatic Jackal to name a few. Some birds spotted on the day were Asian Paradise Flycatcher, Emerald Dove, Malabar Pied Hornbill, Indian Grey Hornbill, Blue-tailed Bee Eaters, Brahminy Starlings and a variety of small passerine birds. There were heavy rains overnight and it drizzled all morning as well. This was not very encouraging and we started the day hoping badly for our luck to change and it did. Although we did not spot any Tigers on the road in the wee hours of the morning, we were welcomed at the Magdi Zone by Gaurs. These Gaurs were introduced to the forest and are not endemic. They are not the usual prey for the Tigers at the reserve and this meant that they enjoyed the forest unchecked. The Gaur population in fact in BTR has risen over the years. Our first good news came at around 8 am when we were informed by the morning safari jeeps that two tigers were spotted at two different locations. We rushed to the first location and realized there wasn't an opportunity for a good photograph. A male tiger (Munna) is fast asleep after feasting on a Sambar Deer kill, lying near by. The thick foliage meant that we could just make out that the tiger is fast asleep. Our only hope was for the tiger to go for a drink of water hole near by however this would be after quite some time as it had rained and usually its the heat that would drive the animal for a drink. So, without wasting time, we rushed to the second tiger location. Well, the story here wasn't different either. A tigress (Raj Bhera's First Litter) also was fast asleep within the bushes and did not show any signs of getting up. We did not get any shots of these two after that but was happy sighting them. We had full day access to the forest so once the morning Safari's were over, we continued the search to finally get Raj Bhera midday by the open grasslands. She came out of the bushes, crossed the road in front of us and rested in the shade. We were able to get a few shots of her while she was resting. Later in the day we ran into Dotty (Tigress) on the road and managed to capture some head on shots with her walking towards us. She also exhibited the Flehman's reaction while on the road owing to another tigress marking within her territory. This made for some really nice shots. The images can be seen further below. By far, Day 2 was our best day in the entire trip with enough sightings and shots. Nothing to report for this day but that we saw the tigress Solo early morning on the road as soon as we entered the zone. As soon as she saw our safari jeep she took cover in the bushes by the side of the road. We drove past here in then hopes that we'd be able to capture some head on shots however, she never came back to the road. On further inspection, we understood that she walked further into the forests through the rock formations, famous in this zone. The rest of the day was spent roaming the forests without any sightings. By midday we were not hopeful for any sightings. We managed to shoot some jackals resting in the shade. Spotted the regular folk of the forest such as Langurs, Monkeys, Chitals, Samba Deer and The only unusual sighting was the Mouse Deer. Last day and we had to make this day count. The past two days, while the Tala zone bereft completely of any sightings, this zone was the one with the most activity. This gave us some hope and this was not in vain. There were plenty of bird activity in the morning owing to the rains overnight. The Indian Pitta, Bee-Eaters, Hornbills, Drongo, Peacocks, Paradise Flycatchers (male, female and juvenile) and Doves, to name a few. The entire morning was quiet with us spotting Raj Bhera and one cub (female), sleeping under a tree beyond a 1000mm lens range. We continued our search for the three male cubs all morning, which should have been close by. It appears they have split up from the mother and sister over night. We searched tirelessly however were not lucky until afternoon when we managed to spot the three cubs taking refuge under a fallen tree among bushes. This was not the best location to take pictures of them as on one side of the fallen tree were thick bushes taller than the cubs and the other side was completely in the shade, filled with obstructions and trees. The highlight of the day came much later when it rained and the cubs came out of hiding to play in the rain. They were jumping and chasing each other and there was almost momentary pauses while they observed the rain curiously. All of these made for some amazing images. Very soon, the evening safari time started and within minutes, there were more than 10 cars around us trying to get a glimpse of the cubs, who by now, went back into hiding. We continued our wait until dusk time when they emerged again from the hiding. One of the cubs jumped up the broken tree and laid flat on it with his head up. A tiger pose does not get more majestic than this. The others also slowly joined him and they played their way out of the bushes and walked across the road in front of the car to finally disappear into thick foliage. The sun had set by now and we felt bliss being able to end our trip in the presence of tigers. We slowly made our way back to base camp enjoying the blissful evening colors of sunset within the forest. The next day I took an 8 hour car ride and 4 hour flight back to Dubai. Overall my first ever trip shooting tigers was amazing. The whole experience that includes tracking the animal, hearing the alert calls of the forest, the respect the tiger commands within the forest as it makes its entry, the color and beauty of the animal and the experience of shooting a real wild tiger in the forest is incredible and would recommend to everyone at least once in a lifetime. I have seen caged or tigers at the circus many times however a tiger that exhibits its own natural behaviour and follows its own intuition in the forest, is something else. I am hoping to make many more such trips in the near future however it will be another year before I get a chance to gaze upon such a marvellous animal again. I will posting these shots in the below slideshow. Watch this space.